If you have ever stumbled over uneven concrete, it's probably a good time to have it lifted and leveled. Uneven concrete is often the result of soil erosion, the warping of the base material, or tree roots. It’s a structural problem that should not be ignored and should be addressed immediately. Unstable concrete has a much higher risk of developing cracks and has more noticeable unevenness. In time, the surface steadily becomes a hazardous path. Luckily, you can contact Ox Foundation Solutions for this problem to be solved. In the past, the most common way to level concrete is through mudjacking. Mudjacking is the process of pumping concrete slurry underneath the settled slab in hopes of raising the concrete. However, we've simplified the leveling process by using a strong yet lightweight material. Our material might only weigh 4lbs. per cubic ft. but its lifting power is greater than mudjacking, meaning it’s able to support substantial loads. It’s a stable material that won’t react negatively to soil or moisture and can fix concrete unevenness in about 15 minutes after injection. It is also waterproof and won’t wash away. Plus, it’s adjustable and noninvasive, so it can be applied in confined areas with ease. Just give us a contact us at 205-303-3404 and our friendly staff will be ready to assist you in your request and answer any of your questions. 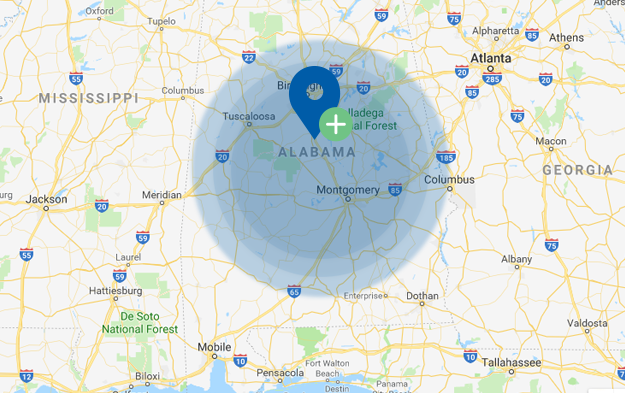 Ox Foundation Repairs proudly serves Birmingham, Montgomery, Tuscaloosa and the areas around Huntsville, Alabama.